Different versions of PGP show considerably different reactions when being confronted with public keys which have been subsequently manipulated. Especially a subsequent contamination of a public key with another person's key will not be noticed and rejected if you use newer versions of PGP, but will be used to produce encrypted messages which can be read in plaintext by everyone who has the secret key corresponding to the key which was smuggled into the original one. This manipulation will not be detected when using some newer versions of PGP and will not be noticed until users are going to have a detailed look at the bytes of the manipulated keys. This study helps to understand this threat, to find out experimentally how a specific version of PGP reacts, and to avoid being cheated with manipulated keys. I would like to point your attention to Philip Zimmermann's personal response to the problem. Since Diffie-Hellman/ElGamal-keys have been introduced with PGP-5.x in 1997 the valuation of PGP became more and more complex. Not only new cryptographic methods, different ciphers for encryption and a new digital signature standard (DSS) with a different public key cryptosystem had come up whose security and reliability had to be compared to the already well-known RSA-keys which brought some confusion about necessary key lengths but also the introduction of Additional Decryption Keys (ADKs) for data recovery by a third party - sometimes called Corporate Message Recovery (CMR) - made it extremely difficult for most users to decide which version of PGP they should use to ensure safe performance and to avoid unwanted side-effects. Additional Decryption Keys had got into the center of criticism because they are linked to a user's public key in a way that every attempt to use the user's public key for encryption would result in an additional encryption of the plaintext using the ADK. Therefore no access to the user's secret key was needed to recover the plaintext by decrypting the message with the ADK, a key which was clearly meant not to be in control of the user. Criticism has focussed on the fact that the link between a user's key and a third-party-ADK creates a perfect means of surveillance of the user's encrypted communication and data, which would effectively result in third-party-access to plaintext as had been pursued previously by key escrow. Same effect but presented to the user in a nicer way. If you do not find anything wrong with ADKs or even if you are happy with this new feature of data recovery the substantial analysis of the risks of third party encryption done by some eleven experts in cryptography might spark some doubts concerning ADKs. Which version of PGP or which guidelines of use would reliably eliminate the risks of Additional Decryption Keys and unintended side-effects? Are the risks of ADK related to the new Diffie-Hellman/DSS-keys only and is it safe to use RSA-keys to avoid compromising of your encrypted messages? How can you be sure no ADK had been used if you encrypt to another person's public key? Is the absence of a warning proof of the fact that everything was going the way you wanted it? Would PGP take notice of the fact that a public key with or without an ADK had been tampered with subsequently? Would a manipulation of any public key show up when you use PGP? Should you use PGP-Classic, version 2.6.x, and give up the new key-formats for good? And would you be regarded as an old-fashioned anachronist blind to the future of modern cryptography exposing yourself to becoming a laughing stock? It is easy to see why a satisfying answer to those questions is extremely difficult to achieve. How can you be sure? You are confronted with different key-formats and you will probably not know all the implications or you will not have the knowledge in matters of cryptography and coding to judge for yourself. Whose expertise would you trust? Is NAI's (or Zimmermann's) assessment on the matter trustworthy after all the confusion they had helped to create with the new versions? There always is the hope a newer version of PGP will correct flaws and problems of older versions but how can you be sure the newer one does not create more problems by replacing well-approved components by fashionable ones? Trust in the latest version can be deceptive as long as you have no evidence. But what could possibly serve as a source of evidence for a sound valuation you are looking for so desperately? The obvious answer would be: A competent and trustworthy expert with a good reputation both in the field of cryptography and as a privacy activist should scrutinize the source code of the latest version of PGP and should sign it after all doubts concerning trap-doors and malfunction have been destroyed by thorough analysis. Although I think it to be possible to find such persons I doubt that they could do what you expect because their judgement would have to include the valuation of the cryptographic quality of a complex software system whose source code had been growing rapidly the current release reaching a couple of megabytes. No expert who wishes to be taken seriously would expose himself to the risk of having missed some detail or having misinterpreted some functionality relevant to the security of the whole complex system. So we cannot expect someone to play this part which clearly shows the curse of ADKs again. On the other hand we cannot just ignore the dangling threat of surveillance ADKs have imposed on PGP simply by putting blind trust into every new version of PGP. As someone with some experience in natural sciences I would like to suggest to take the scientific approach to the problem and simply put different versions of PGP to the test how they deal with manipulated public keys to show a way out of the uncertainty of the present situation. Not what somebody says they will do but rather what they really do should be the base for a reliable decision on PGP. I know all results of experimental research only show some detail and great care should be taken when generalizing these facts. I know as well - as David Hume would put it - that every generalization is false. But to find out how different versions of PGP really react to experiments designed according to a scientific analysis to me seems to be a way out of the disaster. and finally to develop tests for future versions of PGP for himself. This I hope is more than most of the users of PGP are having at the moment. Additional Decryption Keys have been justified especially by Jon Callas, Chief Scientist of Pretty Good Privacy Inc. as a solution for data recovery which will help to prevent government regulation on cryptography. Mr. Callas emphasized his point that an ethically built data recovery software must be surveillance-surely and must be an »opt-in«-system. Linking ADKs to a user's private key should not be possible without the user's consent and in full control of the user, an option you can use if you like and which will require your consent to be active. Furthermore ADKs were designed for use within a closed group of individuals, i.e. in a company and will not affect the use of user's keys who do not wish to benefit from ADKs. But the results of my experiments with manipulated PGP-keys clearly show the alarming truth, that this appeasement is completely untrue, because many users who don't have consented to the use of ADKs simply have no reliable means to protect their keys against subsequent manipulations which contaminate their keys with working ADKs. To have your key ADKed without your knowledge requires no »opting-in«. And this for sure should never have happened. To suit the impatient reader I would like to summarize some of the essential results of my experiments and the conclusions which follow inevitably from these experiments before I go into greater detail. When I started analysing the bytes of a public key which already had an ADK I found the ADK sitting in the self-signature. It is a piece of information of only 24 bytes the last 20 bytes holding the fingerprint of a DSS/DH-master-key. This key produced a cryptogram which comprised a second packet with the session-key encrypted with the subkey of the DSS/DH-key whose fingerprint was in the ADK. After having created my own DSS/DH-key for use as ADK I created a similar subpacket of information with the fingerprint of my ADK and placed it in the original key outside the data which was included in the signature and got a cryptogram which was readable using my ADK's secret key. I then found that every new DH-key being created without ADKs could be contaminated with ADKs in the same way. To apply the same test to RSA-keys I had to create a user's RSA-key with the new type of self-signature which turned out to be somewhat complicated but in the end showed that even RSA-keys when stored in the new format are easy targets for subsequent contamination with ADKs. Any DSS/DH-key can be manipulated to comprise new ADKs without the user's consent or knowledge. The manipulated keys perform as well as if the user had included the ADKs for himself originally. RSA-keys which are transformed into the new key-format with a new self-signature can be fortified with ADKs in the same way. If you want to avoid to risk those manipulations being made on your own key or on other users' keys you are well-advised to use PGP-2.6x, or PGP-Classic, which guarantees that only ADK-safe signatures will be made and which rejects to use DH-keys or RSA-keys in the new format reliably. The following chapters will give detailed information on how signatures and keys are built and will describe the experiments I have performed in some detail. If you like to continue directly with the comprehensive discussion of the consequences you can skip the following chapters. To understand how Additional Decryption Keys actually work and how public keys can be manipulated to hold new ADKs I have to take you into some details about the way PGP stores its information in a public key block. But at first we have to consider the differences between the new format in which those information is stored and the classic old one. Because of the fact that you can only find little information about the structure of PGP-keys the document that describes the OpenPGP-standard published as RFC-2440 was of great help for me even if it contains not a single sentence which deals with ADKs. When PGP-5.x was introduced the way keys were stored and signatures were made changed dramatically. The new format internally became known as Version-4, while the classic old format, PGP-2.6x had already used, was called Version-3, strange but so it is. 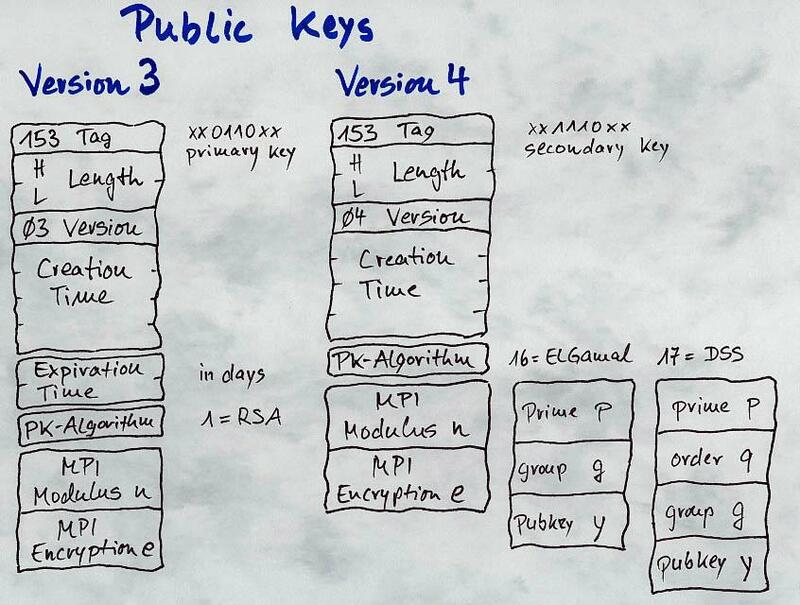 New public key algorithms (Diffie-Hellman/ElGamal) can replace RSA. New symmetric ciphers (TripleDES, CAST) can replace IDEA. New hashfunctions (SHA1 and RIPEMD-160) were supplementing the old hash MD5 introducing longer fingerprints of 20 bytes instead of 16. The concept of subkeys was introduced so that a number of Diffie-Hellman/ElGamal-keys (DH-keys for short) can be bound to a master key whose main purpose is signing. The subkeys usually work as encryption-keys. A new standard for digital signatures (DSS) which uses DH-keys and SHA can replace signatures made with RSA and MD5. FINGERPRINTS: key-fingerprints are created with SHA using the entire packet of key-data and have a length of 20 bytes. Classic Version-3-fingerprints only use the bytes of two long numbers, the RSA-modulus and the RSA-encryption, ignoring information about their lengths resulting in 16 byte fingerprints being hashed with MD5. Key-IDs: The number which identifies a key in the keyring is the 64 lower order bits of the 160-bit fingerprint with Version-4 and is the 64 low order bits of the RSA-modulus with Version-3. Therefore a RSA-key will have a different fingerprint and a different Key-ID in both formats even if the essential key-material, the modulus and the encryption numbers are identical. You can think of all information in a public key block as stored in a sequence of packets of data. Every packet consists of one byte which defines the type of the packet followed by an information on the length of the packet (2 bytes) followed by the rest of the data. If you look at the packets which define the key-material the differences between Version-4 and Version-3 key-packets are not too impressive. Both start with the byte 153, which indicates a public-key-packet. Version-4-subkeys would start with 185. The next two bytes define the length of the whole packet in bytes and the third shows the version-number. The following four bytes give a number that indicates the key's time of creation measured in seconds since 1.1.1970. Version-3-keys then have two bytes which indicate the expiration time in days after creation and these two bytes are missing in the Version-4-format. The next byte gives the public key algorithm which can be RSA=1 for both and ElGamal=16 or DSS=17 for Version-4-keys. The rest of bytes hold "the essential key-material" which is two Multi-Precision-Integers for RSA and with Version-4-keys two, three, or four respectively. A Multi-Precision-Integer is a very long number with the length in bits stored in the first two bytes followed by all the bits that make up the entire number. As you can see a classic Version-3-RSA-key can easily be transformed to Version-4-format by deleting the expiration time, changing the version byte to 4 and decrementing the lower length bytes by two. Voila. The public key algorithm which is used as well as the hash-algorithm can be freely chosen by the user. Every signature can contain subpackets, which insert additional information into a signature. The number of subpackets is indefinite, there can be none or any number of additional subpackets. There are two different parts of the self-signature which can comprise subpackets, one is hashed, that means those subpackets are protected by the signature, but all subpackets in the other part are not hashed and any manipulation in this part will go undetected with the signature. You are right if you suspect that introducing such a field of information is a source of unexpected potentialities. Subpackets have very variable lengths which are sometimes difficult to analyse but most of the packets in my testkeys are short ones, so do not bother. As you can see Version-3 or classic signatures have no complicated design, after the usual byte 137 or 136 which identifies a signature and the packet length they contain a block of data comprising the version number and 5 bytes of data , the type of the signature, that means whether it signs a text or a key or a key with a user-ID, and the creation time. This block of 7 bytes will be hashed together with the data to be signed and will be protected by the signature. The rest of the signature-packet is the signer's key-ID, the public-key-algorithm and hash-algorithm, which always is RSA and MD5, and the first 16 bits of the 128-bit hashvalue which is encrypted with the signer's secret key and stored as a MPI at the end of the packet. Version-4 keys have a similar structure starting with a 4 byte block including type and algorithms but without creation time. This block is hashed with the signature. Following this block there is a field of data with variable length containing any number of signature-subpackets which can hold a vast variety of additional information. Usually the creation time is included as a subpacket of type 02. All those subpackets are hashed as well and every information placed here is protected by the signature. Another field of information which also can hold any number of signature-subpackets follows the first field. But unlike the first field all information in the second will not be hashed and therefore nothing stored here is protected by the signature. That clearly means, that data in this field, I call it the NON-HASHED FIELD of a signature, can be changed without any change of the validity of the signature. Changes in the first field will inevitably result in a corrupt signature, but changes in the second will not. The rest of the V4-signature-packet simply holds 2 bytes of the hashvalue which now might be created using SHA1 instead of MD5 and one (RSA) or more MPIs (DSS) for the encrypted signature data. Where would an Additional Decryption Key be stored? Before I started to analyse the bytes of a public key block I suspected it to be part of the "key" in one way or another. But as we now know, where should it hide? Even V4-key-packets can only be expanded at the end of the packet where MPIs are stored. V3-key packets have a fixed length with only one MPI at the end. To answer this question I would like to refer to the fact that as early as 1997 Kai Raven had drawn the attention of the public to the existence of Corporate Message Recovery Keys (CMRK) in his excellent PGP manual for beginners published in German. He presented a file to download with two keys, one containing an ADK called "CMR User" and the corresponding public key "Little Brother". Roughly speaking the key consists of six different packets, each beginning with an identifier-byte (in red) followed by two bytes which give the length (in blue) of the following data (in black). and finally a Binding Signature packet: identifier 136 with 70 bytes of data. :user ID packet: "CMR User "
As you can see the ADK is sitting in the self-signature in a subpacket of type 10 called (additional recipient request (ARR)) in the first field of subpackets which are hashed and therefore are protected by the self-signature. You see a version number 4 (357) and a signature-type 16 (358) which means this signature signs a key and a user-ID followed by 17=DSS and 2=SHA1, the used algorithms. After that the first field of hashed subpackets begins carrying 3 subpackets of a total of 35 bytes. The first one has length 5 (in green) and subpacket-type 2 (in brown), which is the signature creation time stored in the following 4 bytes as usual. By the way the time is (((((52*256)+77)*256)+70)*256)+30 = 877479454 seconds since January 1st 1970. This is the reference to Little Brother's signing key, as you may see from the reference in the chapter "The Keys for Experiments" below. The last 4 byte subpacket of type 11 holds the preferred algorithms for symmetric encryption. 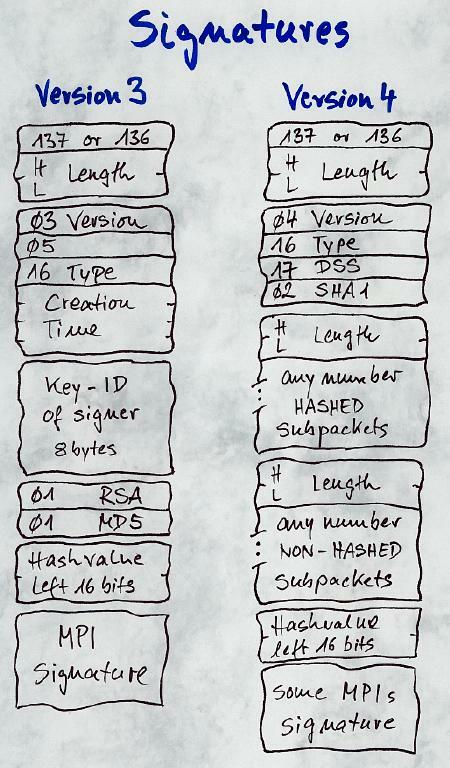 To complete our analysis, the next bytes are the NON-HASHED subpackets with only one 9 byte long packet of type 16 which holds the 8 bytes of the signer's key-ID, that is 34A46056EE4230E3. Note, that only the last 4 bytes appear as the key-ID 0xEE4230E3. The following last two packets hold a 160-bit MPI each, which makes up the encrypted hashvalue, called signature-r and signature-s. After having located the ADK in the self-signature we now can use it to encrypt a text for the user "CMR User" which we can analyse with GnuPG. Because of the fact, that we do not have any secret keys for both keys we are not able to decrypt the message, but as you see there is an additional packet which encrypts the session key used for encryption to the key-ID 0xFF2BBFFD which is the ElGamal-key bound as subkey to Little Brother's master-signing-key, whose fingerprint was stored in the ADK-subpacket originally. So "Little Brother", who has the secret key will be able to read the plaintext of the message, as well as "CMR User" who will use his key 0x183FBE34 to decrypt the message. After fiddling with bytes and packets it is now time to get the bigger picture into view again. Is it possible to manipulate keys in a way so that new ADKs can be placed into them after the user has signed the key? What will be the answers to the questions I have mentioned earlier? And how can they be found with the experimental approach? Let me give you a brief outline of the way I hope to get satisfying answers through experiments with manipulated keys. Before I started I had to create a key-editor, a simple tool to replace a specific byte in a key, to delete and insert some bytes into a key. Starting with the key I have got from Kai Raven (key-A) I created a sequence of variations of this key. At first I made little changes to the creation time, to the fingerprint of the ADK (key-A1) to see if PGP did really take notice of the manipulations. The obvious method for getting your own ADK into an existing one would be to overwrite the whole fingerprint of the existing ADK with your own ADK-fingerprint (key-A2). I created a DH-key (key-C) "control" for that purpose serving as my own ADK with "key-C" as the passphrase for the secret key. Do not say that cannot work because the signature is destroyed. I had to prove if it really does not work. A more sophisticated method would be to try to transfer the ADK-subpacket from the hashed field to the unhashed one still in the self-signature (key-A3) and then to replace the old ADK for "Little Brother" with my new one for "control" (key-A4). When I found this working I was horrified and created a new DH-key (key-B) for "Billy Clean" without an ADK in the self-signature in order to see if I could contaminate this clean key with my "control"-ADK as well (key-B1). The next keys (key-B2 and key-B3) should prove whether or not such an ADK can successfully be placed into a signature of a certification authority. So I had to create a DH-key for my "Test-CA" (key-G) with the passphrase - yes you guessed it - "key-G". The next test was to try to contaminate an old-style RSA-key with my new ADK "control". This gave rise to another sequence of keys starting with a new RSA-key for user "Eddie Clean" (key-E) which was an old fashioned key in V3-format with a V3-self-signature. Using my key-editor this key mutated to key-F, which holds exactly the same key-material (i.e. n and e), but was transformed into V4-format still having the V3-self-signature. But because of the new format, key-F has a new key-ID and a new longer fingerprint. To get this transformation done I had to make the passphrase for key-E (and for key-F as well) empty, because Version-4-secret keys do encrypt the passphrase differently, which took me the best part of a day to find out. The key-F1 was created from key-F by deleting the old key-ID "Eddie" and adding "Freddie Clean" subsequently signing the keys with a lovely V4-signature using GnuPG. Now this key has a correct self-signature and is stored in V4-format still without any ADKs. Applying the same method of contamination I managed to add my DH-ADK "control" to that key (key-F2), but suspecting that this might not work because of cross-community-keys I created a V4-RSA-ADK called "datarecovery" (key-D) with an empty passphrase for the secret key in the same way I had produced key-F. So key-F3 would have this new RSA-ADK added but still got the algorithm-information of 16=DSS in it which I changed to 1=RSA in key-F4. And after having performed intense tests on different versions of PGP with these keys the answers to the questions I mentioned did actually become clear to me but not in the way I was expecting. To guard you through the experiments I will supply you with a detailed summary of all the keys I have created and their manipulated variations designed for the experiments. Each line provides two links one to a readable and of course printable description and one to the key itself. You can also use this file containing all the keys and their documentation. key-F : "Freddie Clean (Testkey RSA)", Version-4 RSA-key with the same key-material as key-E, but different Key-ID and f20-fingerprint. This key has a V3-self-signature. key-A1 : In this key the creation time has been destroyed. key-A2 : In this key the fingerprint in the existing ADK has been substituted by another one "control" (key-C). key-A3 : This key has a destroyed fingerprint in the existing ADK (Little Brother) but a correct ADK-subpacket has been placed in the part of the self-signature which is not hashed. key-A4 : In this key the original ADK has been left untouched but an additional ADK-subpacket with the fingerprint of key-C "control" has been added to the non-hashed part of the self-signature. key-A5 : This key is almost the same as key-A4 but the type of the additional subpacket has changed from 10 (ADK) to 12 (Revocation-key). key-B1 : This key is "Billy Clean's" with an additional ADK-subpacket for key-C "control" in the non-hashed part of the self-signature. key-B2 : This is Billy's key certified with key-G, the DH-signing-key of a potential certification authority. key-B3 : This is Billy's certified key (key-B2) with an additional ADK-subpacket for key-C "control" placed in the signature of the certification authority in the non-hashed part of the certificate. key-F3 : key-F1 with ADK "datarecovery" (RSA) included in the V4-self-signature but with public key algorithm still 16=DSS. key-F4 : key-F1 with ADK "datarecovery" (RSA) included in the V4-self-signature with correct public key algorithm 1=RSA. I have selected the following versions of PGP for the tests, most of them compiled from the source code on SuSE-Linux. Because of the fact that this chapter contains all the experimental data I have collected, it is full of details and should be read as the records of the experiments. I have tried to present the data as readable as possible leaving the interpretation of the experimental results to the next chapter. I will present the experiments in chronological order. And you can find the fingerprints of all binary data produced during the experiments in this file. Pretty Good Privacy(tm) 2.6.3ia - Public-key encryption for the masses. International version - not for use in the USA. Does not use RSAREF. Unsupported packet format - you need a newer version of PGP for this file. No keys found in 'key-A.pgp'. No keys found in 'key-E.pgp'. Renaming the file "key-E" to "key-E.pgp" helps to get this RSA-key added correctly. All keys, key-A1 to key-A5 and key-B1 to key-B3, were treated in the same way as key-A above. All keys, key-F1 to key-F4, were treated in the same way as key-A above. :user ID packet: "PGP-classic RSA-key (Testkey)"
PGP-Classic creates Version-3 signatures and self-signatures. All keys were successfully imported, but key-F could only be imported when key-E was deleted previously. When encrypting a text for user "CMR User" (key-A) a warning is displayed and the resulting cryptogram contains only one encrypted session-key for "CMR User". WARNING: 2 matches were found for recipient CMR. This may not be what you intended. key-A1: It shows sig* to indicate the corrupt self-signature. they encrypt to one key without any ADK-warning. key-A4 and key-A5: Both have good self-signatures and a ADK-warning similar to key-A is displayed. The cryptogram contains only one session-key. key-B1: The self-signature is good, there is an ADK-warning (2 matching keys) displayed but only one session-key is in the cryptogram. key-B2 and key-B3: Both signatures are displayed to be good, no warning is displayed while encrypting and the cryptogram contains one session-key. key-F1: Freddie's key-ID is 0xFD40B97D and shows a questionable signature from key-ID 0x80054131 with a f16-fingerprint E2 09 C7 F2 25 0D A7 6D B4 35 1D 65 1C 1A 63 C5. While encrypting no warning is given and the cryptogram contains only one encrypted session-key. :user ID packet: "unix50-DH-key (testkey)"
:user ID packet: "unix50-rsa (testkey)"
DH-keys are signed with V4-self-signatures and RSA-keys have V3-self-signatures. This V4-RSA-key has key-ID 0x2EED54F3 with a 16 byte fingerprint. The self-signature with key-ID 0xA7CE4BF5 consequently is "unknown signer". While importing key-A an ADK is signalized with a red dot with the key-properties naming it correctly as "Little Brother". During encryption both keys for "CMR" and "Little Brother" are used resulting in a cryptogram with two encrypted session-keys. key-A1, key-A2 and key-A3: All self-signatures are detected "corrupt signature" correctly. No ADK is displayed in the key-properties menu. Encryption results in a cryptogram with one single session-key used. key-A4: After importing key-A4, key-properties show both ADKs, "Little Brother" and "control", in the same textbox indistinctively. Both ADKs were used so that the cryptogram contains three differently encrypted session-keys. key-A5: It performs like the original key-A using ADK "Little Brother". key-B1: While importing the key an ADK is displayed as red dot. The key-properties show an ADK "control" in the textbox, which is used for encryption as well, resulting in a cryptogram with two encrypted session-keys used. This cryptogram can be decrypted with key-C's secret key ("control") ! key-B2 and key-B3: Both keys do not show any ADKs. The cryptogram uses the key of the owner only. key-F: This V4-RSA-key is recognized as V3 with the wrong key-ID of 0xFD40B97D with a 16 byte fingerprint. Eddies self-signature is "corrupt". Encryption produces one session-key. key-F1, key-F2 and key-F3: The V4-key "Freddie" is recognized as V3 with the wrong key-ID of 0xFD40B97D with a f16-fingerprint and a signature from key-ID 0x80054131 which is "unknown signer". No ADKs were shown and the cryptograms use one single encrypted session-key only. This version creates DH/DSS-keys with V4-self-signatures and RSA-keys with V3-self-signatures. :user ID packet: "testkey Windows"
f16 = 3AA9 B31D 6D93 FD10 F835 D042 8613 D5BF. If you append the key-ID A7CE 4BF5 in your mind you have the correct fingerprint for that V4-RSA key. The self-signature with key-ID 0xA7CE4BF5 now is correct. This version handles key-A in the same way as PGP-553i. Encryption is performed with both keys including the ADK and leaving a cryptogram with two encrypted session-keys. key-A4: After importing key-A4 key-properties show both ADKs "Little Brother" and "control" in the same textbox indistinctively. Both ADKs are used so that the cryptogram contains three differently encrypted session-keys. The cryptogram uses the owner's key only. key-F: It has the correct key-ID 0x8005413 but a truncated f16 fingerprint is displayed. The V3-self-signature with key 0xFD40B97D is shown as "unknown signer" correctly. key-F1: Now Freddie's key is recognized with a good self-signature correctly but with truncated f16 fingerprint only. key-F2: This key shows the ADK correctly in the key-preferences menu with an attribute "enforce". The resulting cryptogram now contains two encrypted session-keys, one for the RSA-key and one for the DH-ADK. The cryptogram can be decrypted with both keys! may violate the policy established for other keys in the recipient list. key-F3: Although the RSA-ADK 0xA7CE4BF5 is in the keyring the key-properties ADK-menu reads "Unknown key-ID is 0xA7CE4BF5. key-F4: The key-properties menu shows the RSA-ADK in the textbox. The ADK is used for encryption as well, resulting in a cryptogram with two encrypted session-keys used. Both RSA-keys can decrypt the message! DH-keys are created and signed in V4-format. RSA-keys are created in V3-format and have a V3-self-signature. Even signing a key with a V4-RSA-key results in a V3-signature. All keys were imported (see chapter "The Keys for Experiments" for reference) except key-F which was rejected because of "missing self-signature". Encrypting a text for "CMR user" with key-A results in a cryptogram with only one session-key. No ADK-warning is displayed during encryption. key-A1, key-A2 and key-A3: All keys are rejected because of "invalid self-signature" and because there are "no valid user IDs". key-A4 and key-A5: Both have good self-signatures. Encryption goes on without ADK-warning and produces one encrypted session-key. key-B1, key-B2 and key-B3: All keys have good signatures and encryption performs without ADK-warning leaving cryptograms with one session-key. key-F: It is rejected because of "invalid self-signature". GnuPG generates DH/DSS-keys but does not genarate RSA keys. DH-keys have V4-signatures and V4-self-signatures. :user ID packet: "NEW UID FROM GPG"
This key is key-D "datarecovery" edited with GnuPG to change the user-ID and to create a new self-signature, which is Version-4 on RSA keys! As the experiments show the ADK is without any doubt part of the Version-4-self-signature of a public key. Because of the fact the ADK is not part of the key-material, the key's fingerprint which is computed from the key-material does not change, when an ADK is added. The key's fingerprint does not show the presence or absence of an ADK and therefore users do not have any chance to detect a manipulation using PGP-software. A public key can contain ADKs because of the new concept of signature-subpackets which makes it possible to store the ADK in a type-10 subpacket inside a V4-self-signature. Usually a signature signs the key-material, a user-ID, and a certain part of the signature information as well, the hashed subpackets. If an ADK is placed here it is protected by the self-signature and changing this ADK results in a corrupt self-signature so the ADK will not actually work. The ADK can as well be placed inside a self-signature, but outside the part of information which is protected by the signature, as a non-hashed subpacket of type 10. Such an ADK can be added at any time without destroying the self-signature and it works perfectly. An ADK which is subsequently implanted as a non-hashed subpacket can be added to a clean self-signature which does not contain any ADKs originally. But if the key already has an ADK as a hashed subpacket, the new non-hashed ADK will present itself to the user of the key most indistinctively. Someone who uses this manipulated key cannot see, which one is the hashed one and which one is not, as long as he uses the PGP-software. The difference between both ADKs appears no earlier than the user gets into byte analysis of the key-packets. All Diffie-Hellman-keys have Version-4-self-signatures and consequently all those keys can subsequently be contaminated with any number of ADKs without the user's consent or knowledge. And that clearly means that no DH-key can be considered safe for confidential communication because of the risk of subsequent manipulation which goes undetected with PGP. The use of an ADK results in a cryptogram comprising an additional packet which holds the session key encrypted to the subkey associated with the ADK, whose fingerprint is stored in the type-10 subpacket. This additional packet guarantees that the encrypted message can always be decrypted with the ADK's secret key making it possible for the person who has this secret key to read the message in plaintext. Please note that the person who has the ADK secret key need not be the person who had manipulated the key, because any key's fingerprint can be stored in the ADK-subpacket and no signature is needed to make it work. There clearly is no »opting-in« required to have your DH-key stuffed with any number of ADKs. RSA-keys usually are created as Version-3-keys with a V3-self-signature. As ADKs are totally unknown to V3-signatures such a key can never have any ADKs. But if the V3-RSA-key is transformed into a V4-RSA key and gets a new V4-self-signature even those RSA-keys can be contaminated with perfectly working DH-ADKs. The transformation from Version-3 to Version-4 can be noticed, because the key-ID will change and the key's fingerprint will change as well. Furthermore the old V3-self-signature will not be a correct one because it was made with a key corresponding to the old key-ID. So a new V4-self-signature with the new key-ID has to be created before the contamination with ADKs can take effect. If you don't like to see your public key fortified with ADKs you should not create any key, DH or RSA, with a Version-4-self-signature. But how can you be sure if you have got someone else's public key with a Version-4-self-signature? Since DH-keys all have Version-4-self-signatures, you should avoid to use those for encryption. But detecting V4-RSA-keys is sometimes difficult. Using PGP553i for Windows V4-RSA-keys do present themselves as V3-RSA-keys with key-IDs and fingerprints computed in Version-3-style. Upgrading to PGP651i for Windows shows the same key with a new V4-style key-ID and with a different new fingerprint but truncated to the first 16 bytes, so that it looks like a V3-style fingerprint, which it clearly is not. So if you see 16 byte fingerprints you cannot be sure that the key does not have a Version-4-self-signature. To be sure you have to go into byte analysis of the key packets. Using GnuPG make things worse because all V4-signatures I have created on RSA-keys were made using this program. So if you want to get rid of ADKs as much as possible, you are well advised to use PGP-Classic, PGP-2.6.x, the only PGP which guarantees that only Version-3-signatures are made and which rejects DH-keys and RSA-keys in Version-4-format. You should use GnuPG as an analysis-tool to check which packets a key or cryptogram consists of. And you can use newer PGP-versions or GnuPG to check the validity of signatures on messages which have been made with V4-keys by others. When I look into the future I would like to see some things changed but I suppose some of them will never change at all. Firstly I would like to see more and more people using PGP-Classic, not with mixed feelings but knowing that PGP-Classic is the best PGP you can have on this planet at the moment, and - most important - telling others why. Secondly I would like to see all denigration of RSA-keys as "deprecated" and those recommendations "to upgrade to Diffie-Hellman/DSS-keys in the future" to stop immediately. Do not get me wrong, I consider this an irresponsible misleading of the public because all DH-keys come with V4-signatures. The security of DH-keys compared to RSA-keys is a different question which is not yet settled for me because of the involvement of SHA1 in the Digital Signature Standard and its internal restrictions. Then I would like to see PGP-Software change in a way that deals explicitly with the problem of ADKs and which does not use Version-4-signatures anymore. There cannot be just another debugging of the existing software to get rid of the problem because the user must get a reliable method to prove the fact that keys had not been manipulated and this is missing today. Those who really rack their brains over how to improve PGP might think of a newer, better format for signatures (please do not call it version-5), but stop, signatures do not have to be more complex, they rather have to be more secure, and that would probably mean more simple and - most important - there has to be a security-check-mechanism for the user to prove that there had not been done any manipulation to a given public key. I am thinking of some kind of checking-procedure, may I call it »security-fingerprint«, which checks every security-relevant part of the public-key-packet including the self-signature to make sure that everything is still the way the key-owner had created it. Such a security-fingerprint would have to be as important for a certification procedure as the key-fingerprint. The key-fingerprint for itself clearly does not perform the check I require because it only hashes the key-material. And because of the fact that the security-check-mechanism should be compatible with PGP-Classic the way key-fingerprints are produced should not be changed. A security-check-mechanism could well be a supplementary piece of software, maybe a few hundred lines of code implementing a packet-analyser similar to "gpg --list-packets" with a hash-algorithm hashing the detected key-packets and the entire self-signature as well as a report of the packet-structure being found. Furthermore when thinking about changing PGP's data-formats next time one should try to find a way to integrate X-509 certificates into one single and secure format for both SMIME and PGP. And last but not least make sure that your grandchildren are handed a copy of the PGP-Classic source code when they begin to understand the value of personal privacy. The US-patent on RSA (No 4,405,829) expires September 2000. Cheers to the bottom, ..... !